The lotus root of for food is things that the underground stem of Egyptian bean grows up greatly. 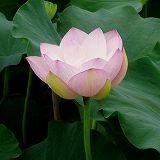 It cannot eat the underground stem of the pond lily though the flower like to the pond lily well blooms. Recently, effective that the element included in the lotus root suppressed the symptom of hay fever was understood, and it came to be paid attention. There is a cave in the underground stem of the lotus root, and it divides into some paragraphs. It is understood that a lot of holes are open when making it to the round slices. Because it is assumed that it can foresee ahead, and the history is good, this hole is used for the special New Year's food at the New Year. In the lotus root, the main one in the part that can be eaten is moisture. Other elements are the carbohydrates, the proteins, the minerals, and dietary fibers, etc.Besides, potassium and vitamin C, etc. are contained. There is an action that makes vitamin C easy not to catch a cold by effective in the tiredness recovery, and making the blood vessel and the mucous membrane strong. Moreover, there is an effect of controlling cancer, too. Vitamin B12 contained in the lotus root can prevent anemia with vitamin C and iron. A lot of dietary fibers of no solubleness are included in the lotus root. This improves working of intestines, cancels constipation, and prevents the large intestine cancer. It is effective also in arteriosclerosis and high blood pressure. The mucin of the lotus root is protected the stomach wall, and contributes to the resolution of the protein. The load of stomach and intestines is lightened, and it is effective also in the nutritional fortification. Hay fever has been prevented with the lotus root and the lactic acid bacterium. Recently, effective that the element included in the lotus root suppressed the symptom of hay fever was understood, and it came to be paid attention. "Haruhisa Wago" Doctor of Science was announced, and there is information of useful for hay fever and the prevention of the allergy by matching the lotus root and the lactic acid bacterium and taking it. This examined power to suppress an increase of the IgE antibody in blood where the allergy was caused with six kinds of vegetable broth of garlic, the leek, the Welsh onion, the onion, and the perilla and the lotus root. There seems to have been power to which the lotus root suppressed the allergy very much in these six kinds of vegetable broth. It was thought that power to suppress the allergy doubled if an effective lactic acid bacterium and lotus root for the improvement of the allergy were taken together and was investigated. As a result, the person of 81% is experiencing the improvement of hay fever. It seems to be effective in hay fever to paint on the interior of the nose, and to drink the boiling soup of the lotus root applying the squeezing soup of the lotus root to the cotton bud. It is said that it doesn't blacken when the skin is peeled off and it applies it to water and the acidulated water to cook the lotus root. Afterwards, making to the round slices and using it are general. The one on the market also has the method of using this in a suitable size because it is divided. The lotus root dish is generally used for the boiled food. It boils adding seaweed, the dry mushroom, and meat. Moreover, it makes to the vinegar lotus root, and it is used also for the material of the vegetables and omelette like fried egg on top well. It is processed to the print sink, the lotus root chips, the sugar pickle, the cherry blossoms lotus root (flower leaflet lotus root), and Kanehira, the tempura, and the mustard lotus root, etc. as other dish examples and it is used.